A prison warder holds the hand of Brian Bagyenda with Innocent Bainomugisha and Vincent Rwahwire (FILE PHOTO)KAMPALA – Brian Bagyenda 29, a son to ISO director Col. Kaka Bayenda has failed to reach a plea-bargain agreement with the state in which he wanted to plead guilty to charges of murdering his girlfriend Enid Twijukye in exchange of a lighter sentence. This has been reported to court by Bayenda’s lawyer Mr Nsubuga Mubiru who then asked for an adjournment to January 22, for the hearing of the case. Mubiru also told court that he needed to photocopy and read through the file he had just received in the morning of witness statements and other documents from the prosecution. Although prosecution led by Mr Joseph Kyomuhendo was ready for the hearing with five witnesses. However, Justice Anthony Ojok Ayu has instead pushed the case to the next criminal session to be allocated to another judge saying he cannot proceed with hearing evidence in the same file where he has been actively participating in plea-bargain negotiations. 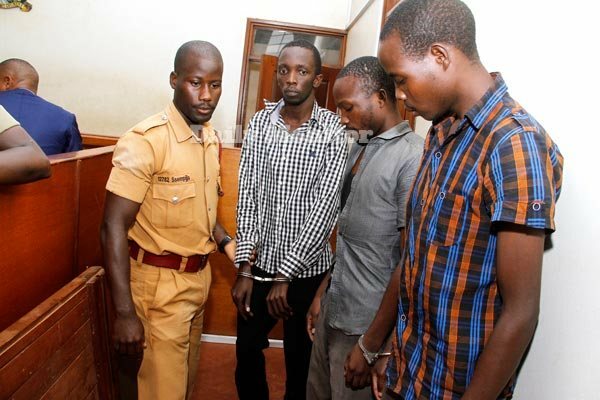 Bagyenda a Pharmacist together with Bainomugisha Innocent; a cleaner and Vincent Rwahwire a casual labourer who are all residents of Kimwanyi zone in Luzira Nakawa Division are charged with the murder of Twijukye; a former 22year old former student of Ndejje University. Prosecution says the three committed the offence at Njobe road in Luzira Nakawa Division at the home of Brian Bagyenda before dumping Twijukye’s body in Namanve forest where it was later recovered by police. They have been sent back on remand at Luzira prison until then. Plea Bargain is a justice system is where an accused admits the alleged offence and in return is handed a lenient sentence on conviction. In case where the plea bargain has failed the case is set for trial.